The oyster run on Wednesday was successful. I got to the market early, and there were no crowds. "Ça va arriver tard aujourd'hui," is what the guy said when I mentioned that there weren't many people about, predicting that the market would get more crowded later in the morning. That was fine with me. Wild berries on the margin of the vineyard. I made two mini-loaves of rye bread to serve with our oysters. We'll also have a Caesar-style salad to go with them. We'll finish up some walnut-raisin biscotti that I made a few days ago for dessert. Then Ken will start preparing the beans for our New Year's Day meal of cassoulet with duck confit. I'm sure he'll have some pictures of that to share on his blog. I'm going into town this morning to buy some oysters for New Year's Eve. Saint-Aignan is having another special market day in advance of the holiday, an occasion for feasting late into the night. We won't be feasting late into the night, however, but enjoying our réveillon at lunch time. We'll probably be snug in our beds well before midnight. 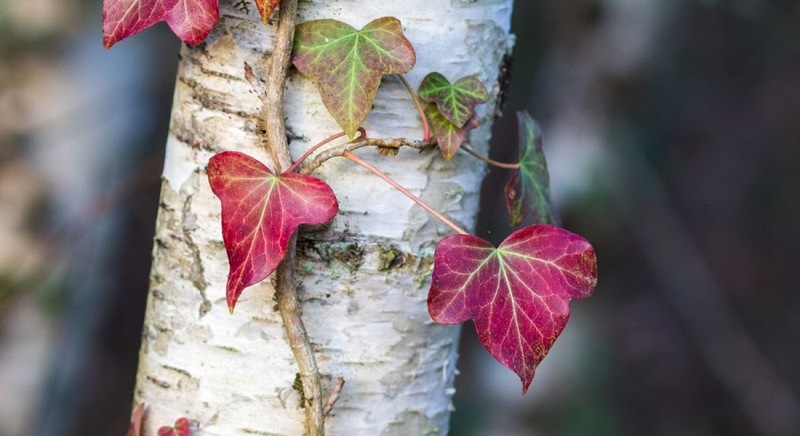 Ivy on a birch tree. We're expecting a drop in temperatures and some rain over the next few days. I've got to gather up some kindling and put it in a dry place when I get back from the market. We're having left-over turkey pot pie for lunch today, so there's not a lot of preparation to do. Today makes the fifth day in a row we will have enjoyed our Christmas turkey. Ken's making a mushroom and barley soup with turkey broth and some chunks of turkey meat. Yesterday we had a turkey pot pie. And I'm not tired of it yet. We have more broth for the freezer, and bits of turkey skin and other parts that Callie will eat. 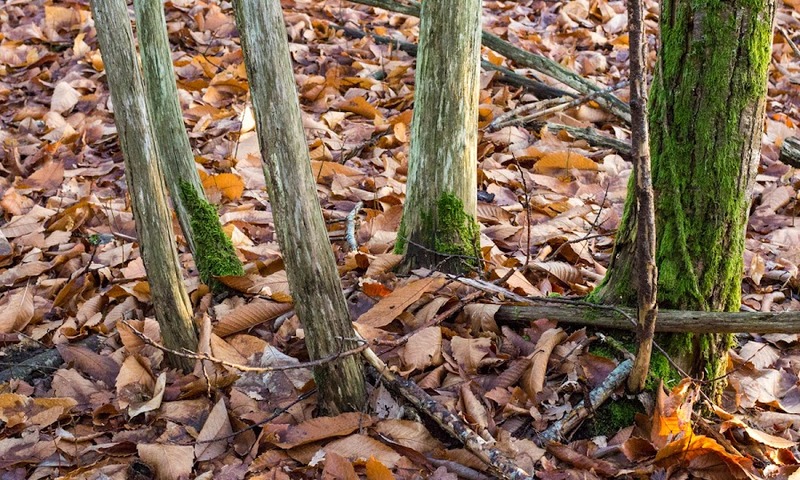 A stand of small trees in the woods where Callie and I often walk. I had a fire in the wood stove on Monday afternoon. It wasn't cold outside, but the house felt a little chilly, so rather than have the heat come on, I built a fire. I let it die out in the early evening as the living room got up to 21ºC (almost 70ºF) and it felt warm. 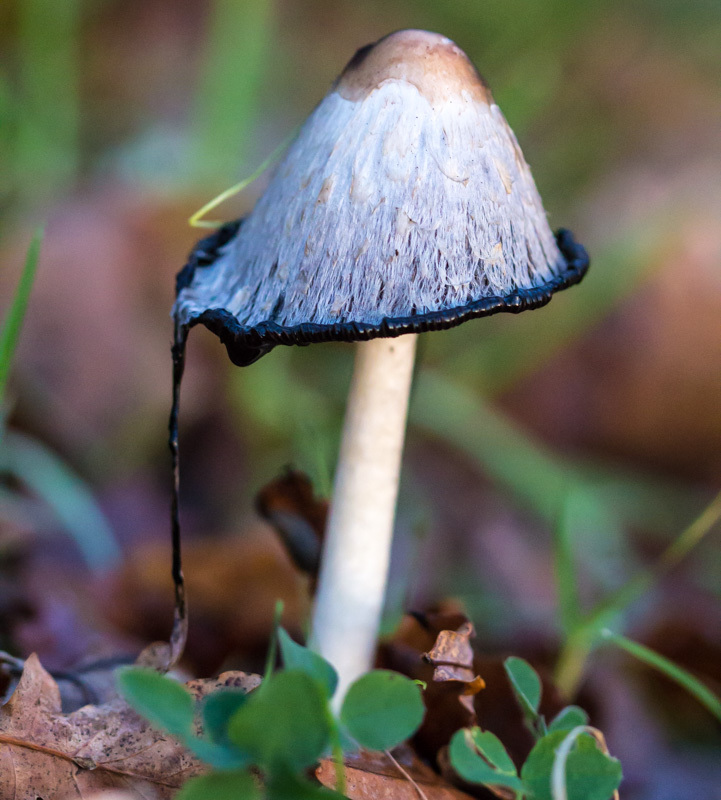 From what I can find in our mushroom book, this is un coprin chevelu (coprinus comatus), known as a shaggy ink cap or shaggy mane mushroom in English. These are supposedly good mushrooms to eat young, but this one has gone beyond that stage. I see lots of edible youngsters out there, pushing up from under the leaf litter. I won't be trying any. Coprin chevelu, 100mm (macro), f/2.8, 1/250s, ISO 3200. I've noticed that many of my macro and 50mm shots have very high ISO settings. This often makes the images "noisy" or grainy. I can fix that a little in post-processing, but the end result is never as crisp as I'd like. The reason for the high ISO is that the camera is hand-held when I take the photos. The light level is often very low during our morning walks this time of year, so I need a wide aperture and a fast "film speed" to get the exposure right. Not to mention that I need a fast enough shutter to minimize the effects of camera shake. I think that if I used a tripod, I could lower the ISO, close the aperture down some, and use a slower shutter for a crisper photo with more depth of field. This morning is the chilliest morning we've had in a while with a temperature of 4ºC (about 39ºF). Not very cold for a late December morning. Normally we'd see temperatures much closer to freezing (0ºC) early in the morning. Our unusually warm winter continues. Two in a row! This is Callie on Christmas Eve, all excited anticipating the arrival of Puppy Claus. Not. She was snoozing under the coffee table and was gracious (or lazy) enough to let me take a couple of pictures. 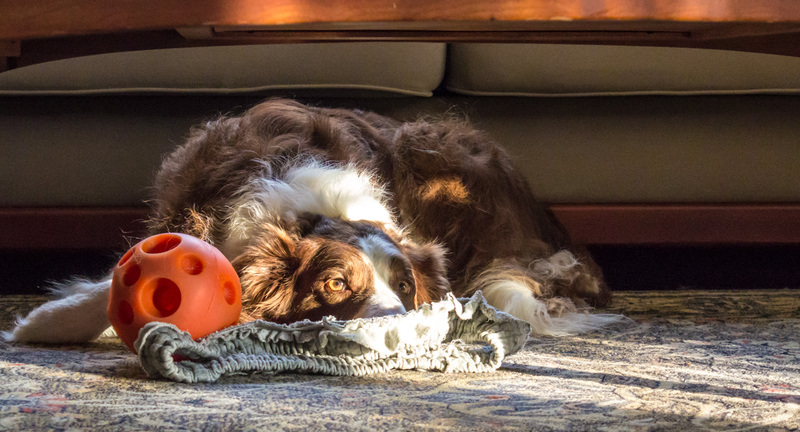 Callie lounges in the morning sun with her tricky treat ball and the waistband from an old pair of sweat-pants. The weather continues to be lovely, or freaky, depending on your perspective. I haven't had a fire in many days. I wonder how much longer this will go on. Still, we have January and February to get through. I'll bet it will get cold before too long. A walk in the woods will do us good. I'm feeling rather stuffed after our wonderful holiday meal of figs and foie gras, turkey with stuffing, cranberry sauce, brussels sprouts, butternut squash, and a pineapple upside-down cake for dessert. Today we'll dive into the leftovers. 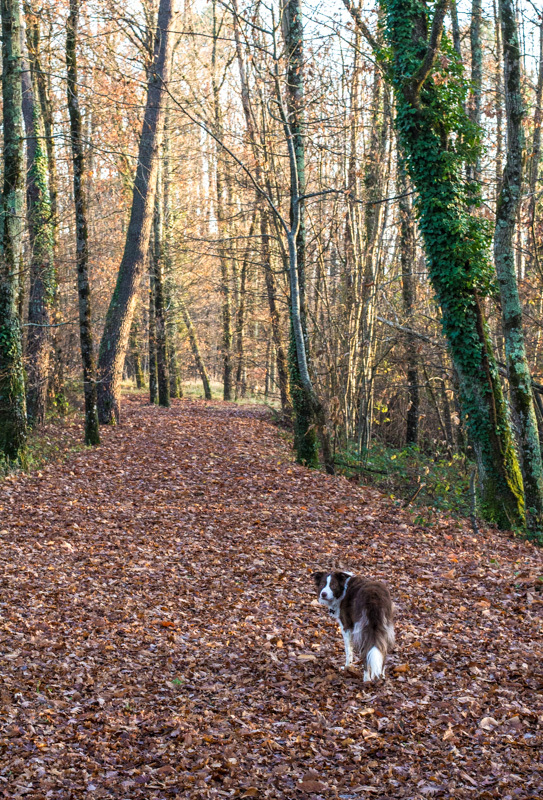 Heading into the woods with Callie on one of her favorite paths. Now it's the week-long slide into the new year. 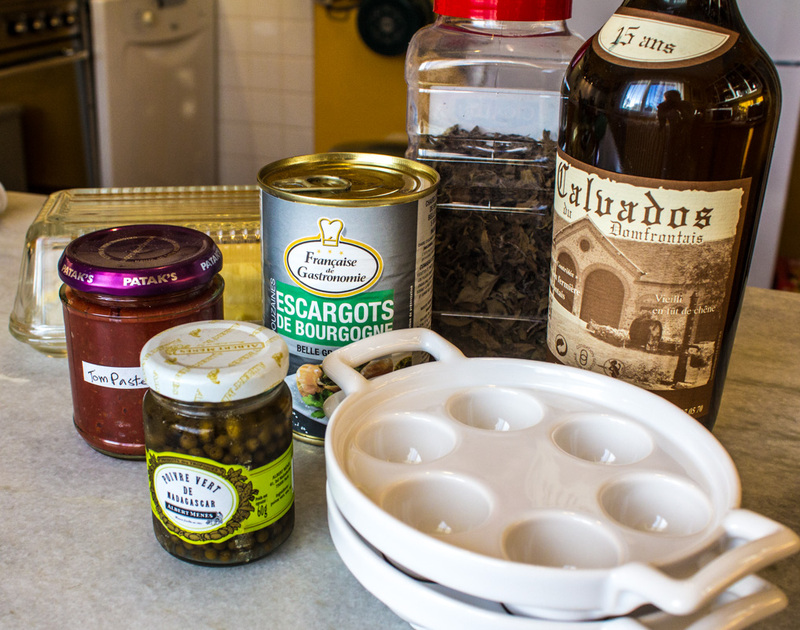 We're planning oysters for New Year's Eve, then Ken's making a traditional bean dish for New Year's Day: a cassoulet with his own duck confit. Yum! There will probably be pictures. Note: "What's on tv" is taking the holidays off! There was enough steak left over from Monday's steak au poivre for one-plus more meals. 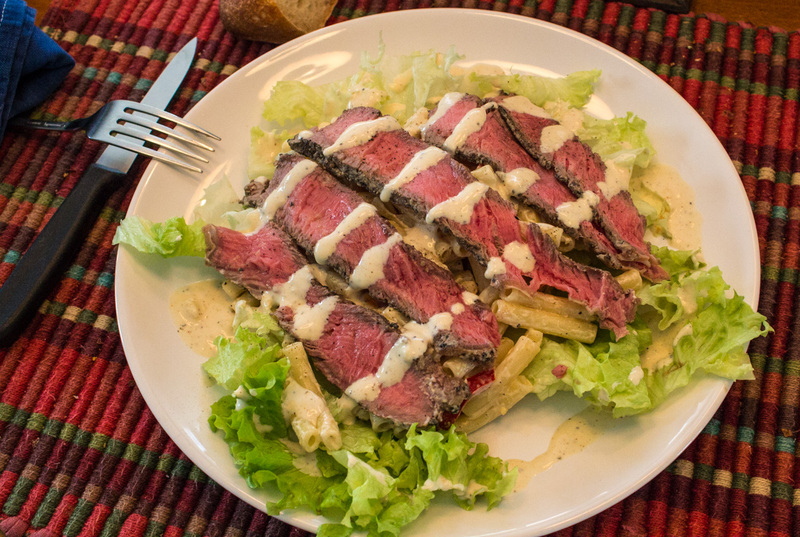 So, on Tuesday, we made a big pasta salad with a peppery ranch-style dressing, served it on a bed of lettuce, and topped it with thin slices of beef. A great way to enjoy the leftovers! Tuesday's lunch: pasta salad topped with thinly sliced peppered steak. On Wednesday, we took a break from steak and Ken made a shrimp fried rice with home-made kimchi (Korean fermented cabbage). I won't tell you that we made that kimchi nearly six years ago. Oops. It was delicious. It was my morning to walk Callie, so Ken got up and out early to the market to pick up the turkey that we ordered for Christmas Day. It's a nice looking bird and weighs in at about 3.7 kilos (just over 8 lbs. ), so it should feed us for quite a while. 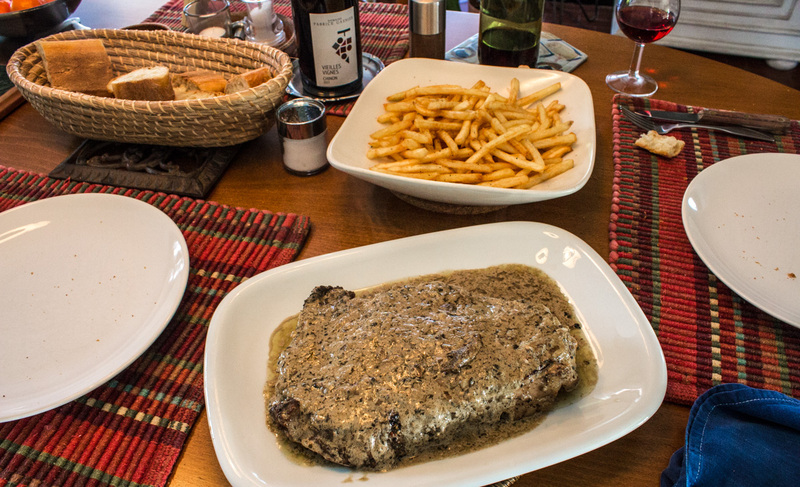 As I do every year since 1981, I had steak au poivre (steak with pepper sauce) as the main course for the birthday lunch. The cut of meat varies from year to year. We've used everything from filet to sirloin to flank to rumsteak to faux-filet and even ground beef patties, depending on the year. This year we used entrecôte (rib-eye, club, or Delmonico steak), cut very thick, from a butcher across the river in Thesée. His is the best entrecôte I think I've ever tasted. It was a big steak and a good deal of it was left over for lunch on Tuesday. 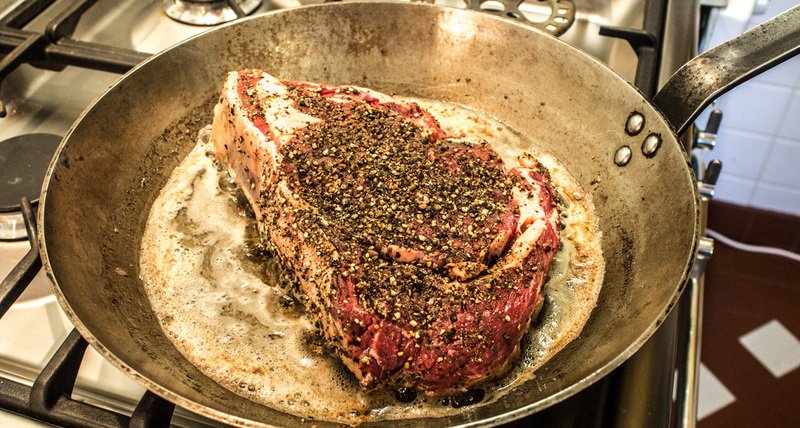 Our entrecôte marinating in crushed black peppercorns. 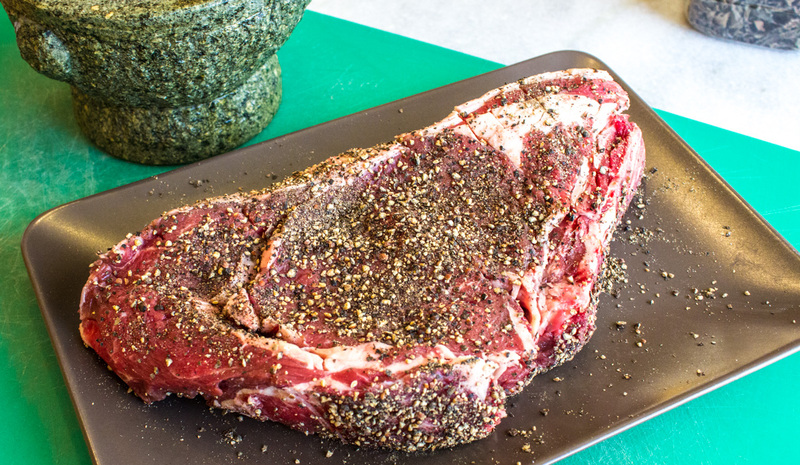 I dry-rubbed the steak with crushed black peppercorns (done in a mortar) and let it sit for an hour or so before cooking. Then Ken seared the steak on both sides in a hot pan with butter. After that, he removed it to a low oven to keep warm while the sauce was made. Searing the steak in butter. To make the sauce, Ken de-glazed the pan with calvados (apple brandy from Normandy), flambeed it, and added chopped shallots and crushed green peppercorns (for another layer of pepperiness). He stirred in some cream for more richness and reduced the sauce a little. Then the steak (with all the juices it released) went back into the pan with the sauce. Lunch is served! Those specks on the plates are bread crumbs left from the first course. We normally serve the steak with French fries; they're great dipped into the sauce. And a green salad dressed with vinaigrette afterward is a great way to cleanse the palate, if you have room - we didn't this year. With it we drank a 2013 Chinon, made from cabernet franc grapes, that was given to us by friends J&N. In France, a typical meal has three courses: l'entrée, le plat principal, and le dessert. In the UK, I believe these are known as the starter, the main course, and the dessert. In the US, we call them the appetizer, the entree, and the dessert. I don't know why we Americans call the main course the entree; it makes no sense at all. 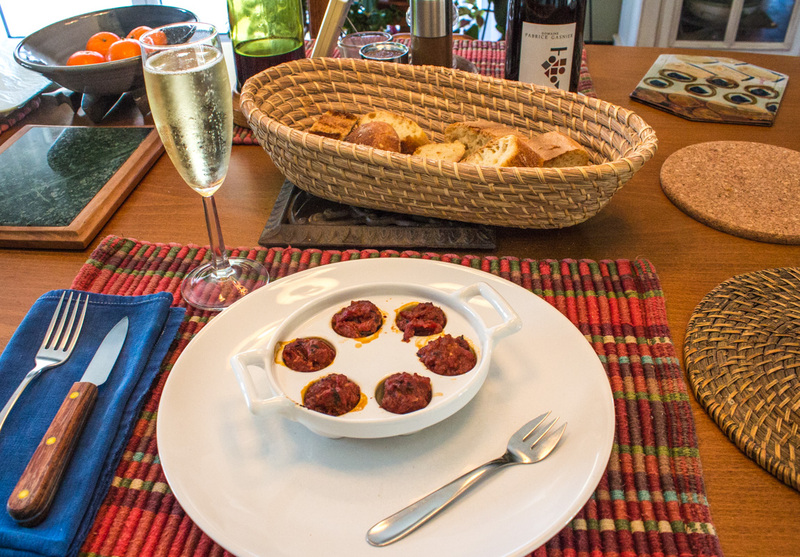 Six snails per serving, and the last of the bubbly Saumur. There are variations on the standard meal, of course, the most common of which are the addition of an hors d'œuvre and/or apéritif before the entrée and a cheese course before, or in place of, the dessert. For my birthday lunch yesterday, we started with an apéritif of sparkling Saumur (Loire Valley) wine. The bubbly was dry and delicious, made from mostly chenin grapes possibly blended with a little chardonnay. Some of the ingredients of the day. Our entrée was escargots sauce tomate (snails in a tomato sauce). The snails themselves come in a can, already cleaned and cooked. I made the sauce with some of our home-grown tomato paste, chopped garlic, home-grown oregano, smoked paprika, and hot pepper. I heated the snails and sauce in a hot oven, then served them with baguette slices. The tomato paste sauce was a nice change from the standard garlic/parsley/butter sauce. They were delicious! Our plat principal was steak au poivre (steak in a pepper sauce). More about that tomorrow. The heating technician came back last Thursday to relocate the base station for our wireless thermostat. It took him about an hour to move the box and re-regulate the system, but I have to say (knock on wood) that it worked. We've moved the remote unit around to different places and it hasn't dropped the connection once. That's more like it. 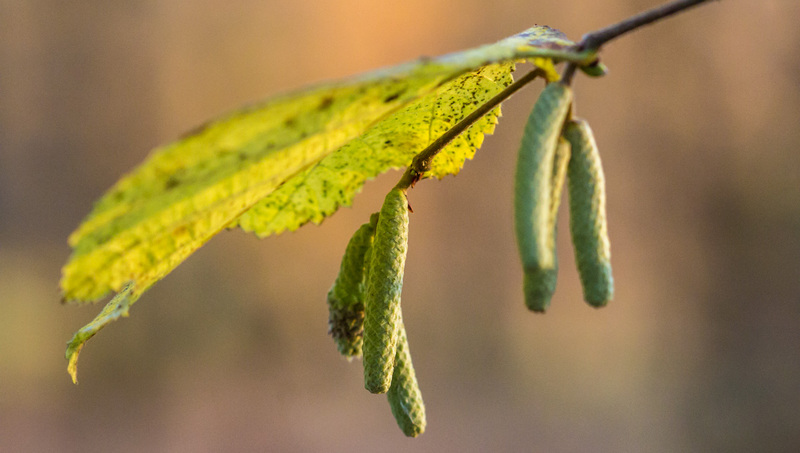 Catkins on a birch (I think) tree. It's not like we're needing a lot of heat right now. Temperatures are curiously mild and are expected to stay so for another week. Everybody's talking about it. Nobody's doing anything about it. Rim shot. 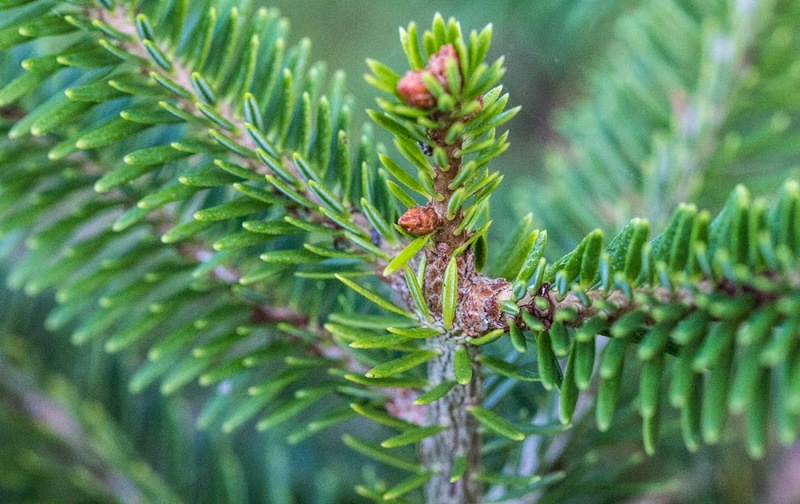 I found two little fir saplings outside our fence one year. They were no more than a few inches tall and I was going to cut them down with the mower, but we decided to put them in pots. They're about a foot tall now and would likely be taller if they were not in pots. I think we'll plant one of them in the ground soon. We've picked a spot where it won't shade anything important. If we don't like it, we'll remove it later. One of two little potted fir trees. The stores and markets are humming with activity as people all around shop for their holiday meals. We did a little on Saturday and we'll head out again on Wednesday to pick up the turkey we ordered for Christmas day. We still make our meal on Christmas day, American style, rather than on Christmas eve, French style. I'd rather eat a big meal mid-day than later at night before bedtime. This week is Christmas week. School vacations start today. The new Star Wars movie is in theaters, and one of our channels will be running all six previous Star Wars movies, one each night starting tomorrow. 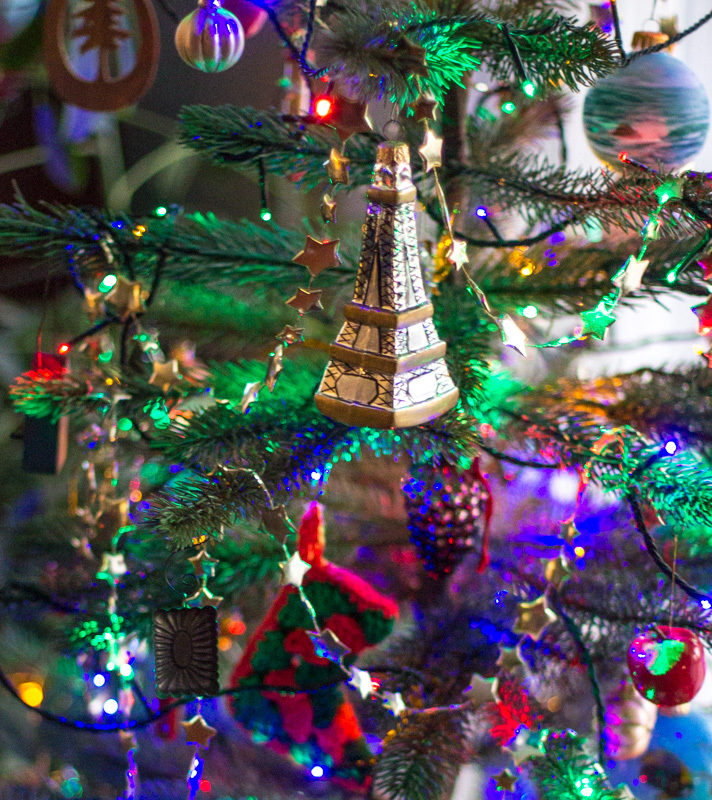 And Michelin-starred celebrity chef Philippe Etchebest is sharing a recipe for Christmas Eve. This time the Americans teamed up with the Canadians to bring us Christmas-themed disaster of a disaster movie. Its original title: "The 12 Disasters of Christmas." 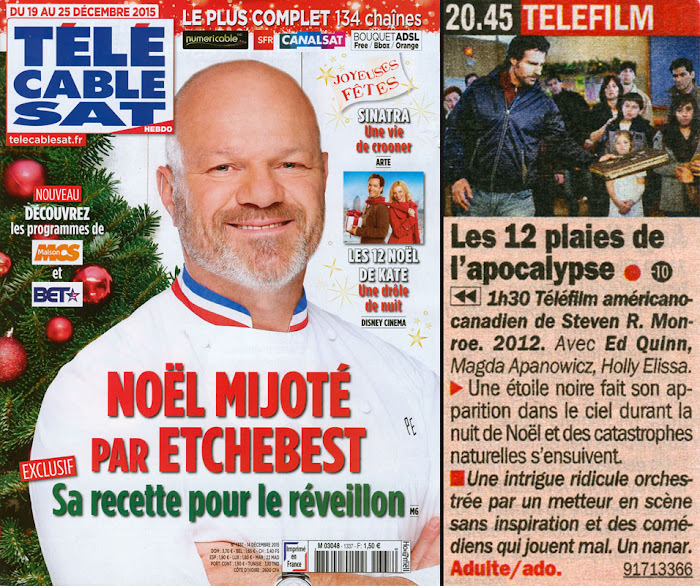 Les 12 plaies de l'apocalypse (The 12 plagues of the apocalypse). American/Canadian made-for-television movie directed by Stephen R. Monroe, 2010. With Ed Quinn, Magda Apanowicz, and Holly Elissa. ► A black star appears in the sky on Christmas night and natural disasters follow. A ridiculous plot orchestrated by an uninspired director and bad actors. A bomb. The Comets, the Cupids, and me. 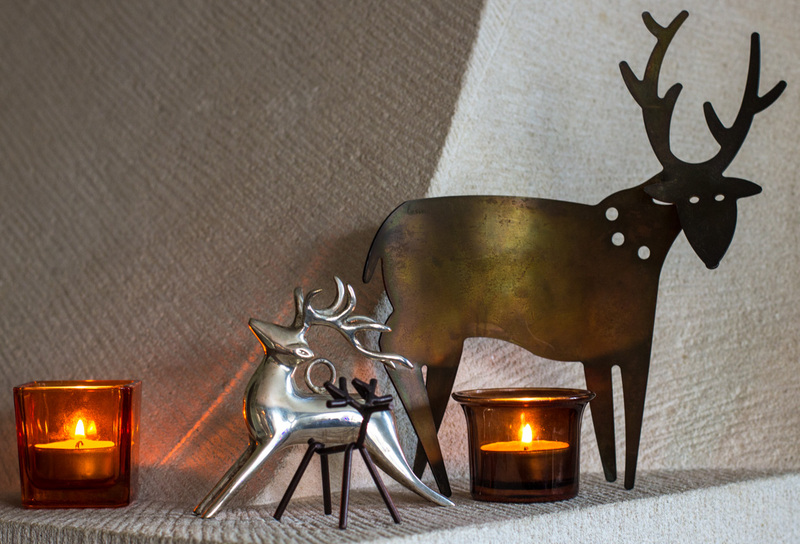 Three little reindeer, 50mm, f/5.0, 1/8s, ISO 200. With apologies to Kermit the Frog. I have three little reindeer. One, the littlest, stays out all year. The other two only come out at Christmas time. And no, I haven't named them. It may not surprise you to know that I've saved greeting cards. Birthdays, Christmas, and others. 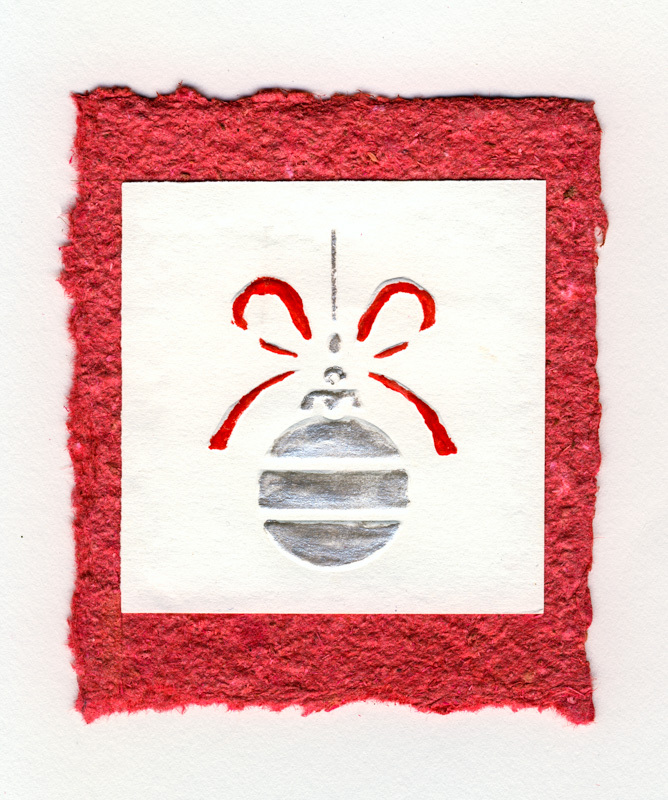 One of my very good friends, Sue in California, makes many of her own cards and, when I get one, I save it. Each card is a little work of art. This one is from 2005. A nice ornament for the tree. Except for this one, I forgot to make note of which year each of her cards was sent. They're wonderful and I love them, I just don't remember when I got most of them. And, while she signed them, she didn't add a date. No matter, they're still pretty. As usual, there is still a lot of green to be seen around us. Aside from the evergreen trees, that is. This time of year, our grass is deep green rather than the parched brown of summer. Small plants on the edges of the woods continue to grow, although there are fewer of them this time of year. 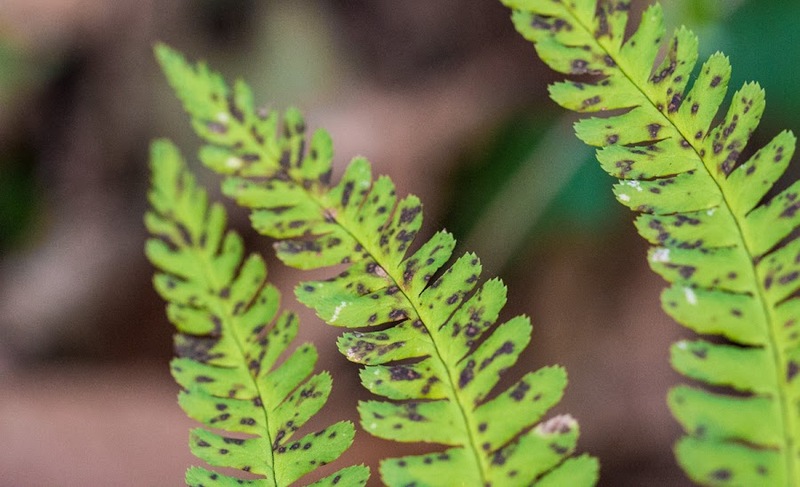 And that includes some ferns, even if most of the big ferns in the forests have gone brown. I put up the holiday tree on Monday, added the lights on Tuesday, and today I will hang the baubles and other decorations. We had the heating people in yesterday to look at our wireless thermostat problem and they agree that the base unit is not properly located. They're coming back on Thursday afternoon to relocate it so that its signal won't be blocked by the boiler itself. I'm hopeful that the fix will give us more flexibility in where we can place the remote wireless unit. It's intended to be movable, but right now there's only one place where it works properly: on the dining room table. Not the best of photos, but it gives you the idea. I strung lights up over the weekend, the first time I've put them along the roof line (where the rain gutter is, not at the top!). In past years I've just wrapped the string around the railing on the deck, but this year I wanted a change. The foggy evening gave the photo an eerie blue cast. Putting hooks into the ends of the rafters was much easier than I thought it would be, especially above the deck. The part above the kitchen window was a little trickier because I needed the extension ladder, and that always makes me a little nervous. I know I could never have been a roofer. Those guys climb up and down as if they were spiders. 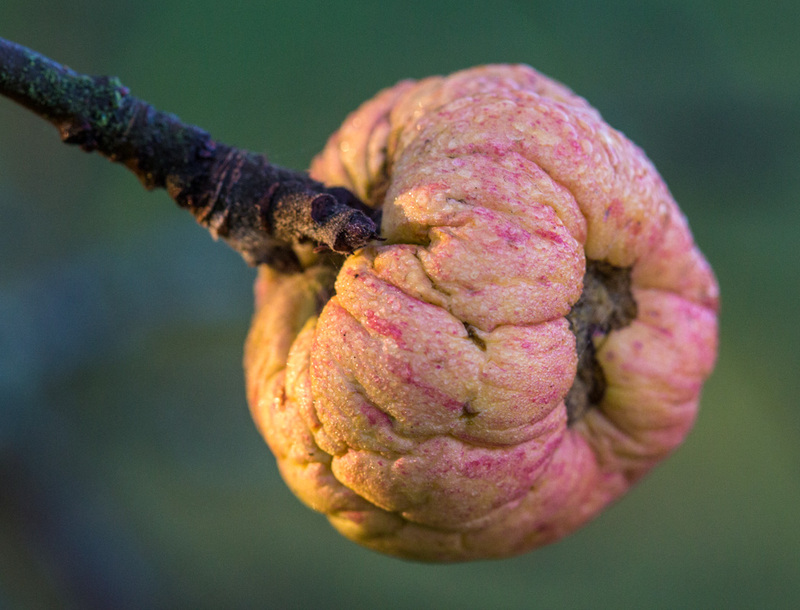 While the leaves are gone, some apples still cling to the pommiers (apple trees). I wouldn't want to eat any of them, but they make for pretty photos. A tiny wrinkled apple in the morning sunlight, 100mm (macro), f/4.5, 1/250s, ISO 1250. The big news in France this weekend is the result of the second round of regional elections. It gets complicated, but the upshot is that the extreme right wing party, the Front National, didn't take a single region even though it did very well in the first round. The standard right wing, Sarkozy's aptly re-branded Républicains, took seven of the thirteen regions in play, even though the numbers show that the left wing Socialists took more départments than the right (which doesn't have any real impact since these were regional elections and not departmental elections). See? It already got complicated. I'll stop there. 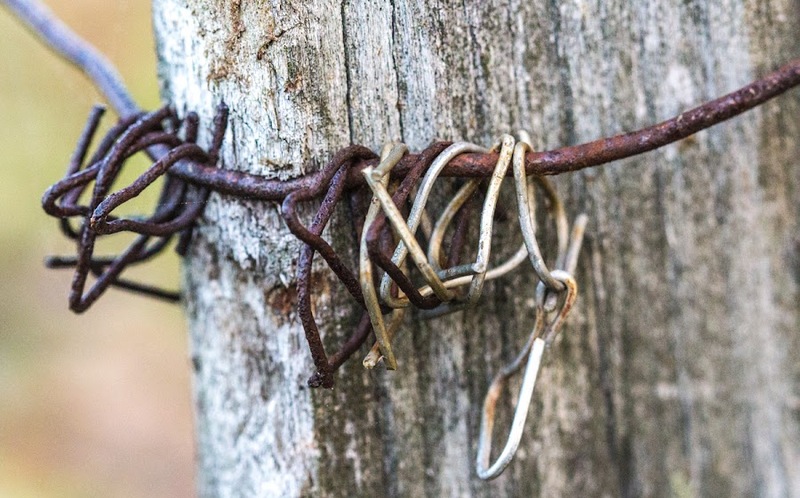 These are agrafes (staples) that are used to tie vine canes to their support wires in the vineyard. In most cases, the single cane that is left after pruning in bent horizontally, then fastened to the wire with these little metal rings and a mechanical stapler. Year after year, the staples accumulate on the wire. This bunch is gathered up against a post. Ken and I went to the market on Saturday morning and ordered our Christmas turkey. We'll pick it up at the special market day on Wednesday the 23rd. We also got a bunch of coques (cockles or little clams) for our lunch yesterday: linguine with white clam sauce. They were delicious! There'll be another special market day on Wednesday the 30th, so we'll go and get some oysters for New Year's Eve then. Star Wars. Nothing but Star Wars. This week's television program magazine comes with one of two covers to celebrate the release of the new Star Wars movie. One cover represents the "light" side of the Force (I've never heard of it referred to that way), the other represents the Dark Side. The cover we got in the mail is, as you can see, the "light" side version. You can see the Dark Side version in the inset. The television program announces a theatrical release. Entertainment news is entertainment news. Even a French film starring Catherine Deneuve can get a red dot, as this one has. Elie Semoun is a French comedian and actor. He's ok in small doses, but is not one of my favorites. I probably won't be watching this film. Cyprien. French movie directed by David Carhon, 2009. With Elie Semoun, Catherine Deneuve, and Vincent Desagnat. ► Thanks to his magic deodorant, a particularly ugly IT guy finally becomes handsome and makes a place for himself in the fashion magazine for which he works. The characters are total caricatures, painted in broad strokes with disdain, and the direction is transparent. A very painful comedy. Out among the vines behind our house is a line of acacia trees. In spring, the white flowers are fragrant and their petals carpet the ground as they fall. At this time of year, their seed pods fall and split open, exposing the little bean-like seeds. One of hundreds of acacia seed pods on the vineyard road, 50mm, f/3.2, 1/125s, ISO 250. Thursday was a chilly day. Our high temperature was around 5ºC (around 40ºF), but the lows were close to freezing. I spent the morning screwing little hooks into the rafter beams on the front side of the house. Then I strung up some holiday lights. Up until now, I've been wrapping the light string on the deck railing. But this year I decided to string the lights up along the roof line. I worry about teetering on ladders, but this wasn't too precarious a job and I survived to tell the tale. I'll try to take photos of it at some point. It happens all the time. One day you walk into a grocery store you've been going to for years, and everything is changed around. Well, not everything, but enough stuff has been relocated to throw you off your rhythm. It happened yesterday. The shampoo, soap, and toothpaste aisle was not where it was supposed to be. One whole end of the store had its shelves turned perpendicular to the way they were before. I missed produce altogether. 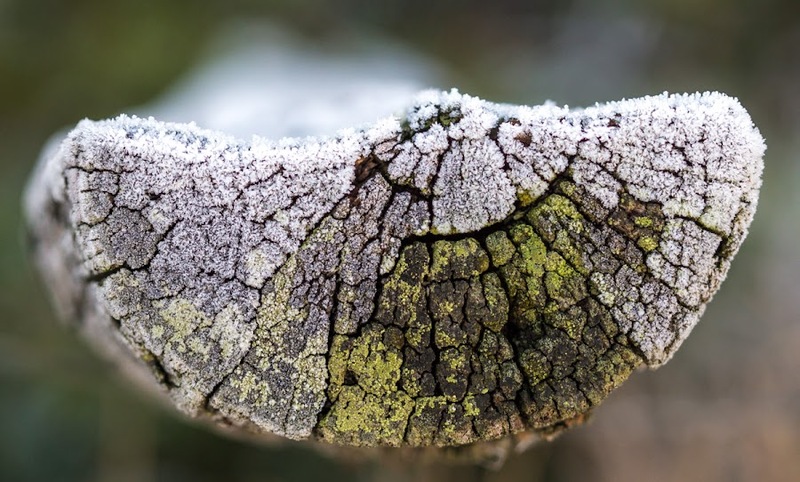 The frosted end of a vineyard post. I know there are good reasons for this kind of change. Well, one good reason. Marketing. Figuring out the shopping psyche and trying to place products where they will be noticed and bought. Forcing shoppers to walk down every aisle looking for their regular items in hopes that they will see something new and pick it up on an impulse. The whole place is engineered to get shoppers to fill up their carts. People are paid to study this. People are paid to determine which changes will work and which will not. People are paid to analyze shopping patterns before and after changes to maximize revenue. And we shoppers know they do it, and we adjust to it, and we happily pay them to do it again. A minor weather system moved through on Tuesday, bringing us a little rain. Not much at all and with no wind, thankfully. I was able to get outdoors and do some minor cleaning up in the garden while it was still dry. Earlier in the fall I had set out concrete tiles under the winter squash to keep them off the ground. So, now that the squash are harvested, I wanted to gather up the tiles and put them away. And I pulled the remaining tuteurs (stakes) out of the ground and put them away as well. 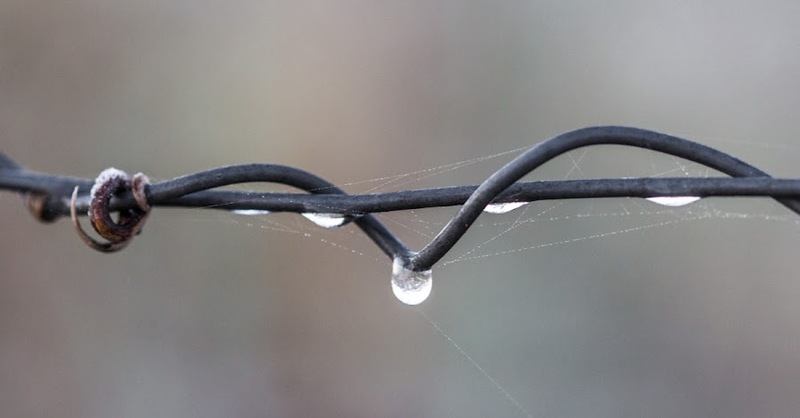 These are dew drops, partially frozen, that I noticed on guide wires in the vineyard on a recent frosty morning. There is still the rose pruning to do, but that will wait for a while. And I need to trim up the lavender and sage bushes at some point during the winter. Since my elbow has been hurt, I haven't done the hedges. The elbow is getting better, very slowly, so some time before the spring growth starts I will get those hedges trimmed. Not the tall ones, mind you. Just the low hedges that I can trim without a ladder. Rose hips-ters, that is. There are still rose blossoms here and there in the neighborhood's gardens. But most of the rose bushes around us are covered in hips, especially the wild roses out along the edges of the woods that surround the vineyards. The hips pictured here are not wild roses, but garden-variety plants along one of our neighbors' fences. 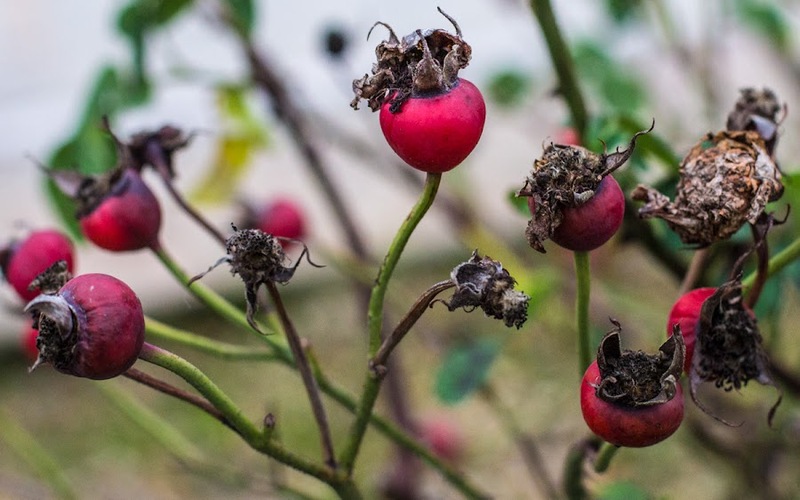 Rose hips provide color in late fall and early winter. Our roses, the few we have left, are no exception. I plan to cut them back once it gets colder, although I don't really know if it matters when I do it. I've read that it should be done before the sap starts running in spring. For us that means January or February. I've also read that it should be done when the plant stops flowering. For us that means any time now. And I've read that it depends on the variety of rose you're pruning. For us that means I have no idea. I thought this chestnut (I think) leaf looked like the blade of a table saw. In screaming yellow. We had a light frost on Saturday morning when I had the macro lens out. Frost changes everything. 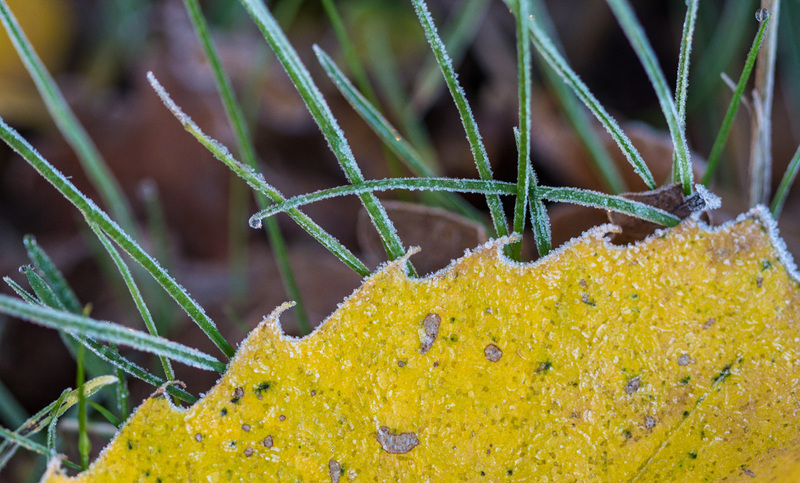 Frosted leaf in the grass, 100mm (macro), f/2.8, 1/160s, ISO 640. On Sunday we visited our closest wine cooperative which was hosting what they call a marché de Noël (Christmas market). It's a special event where local (and some not so local) artisans gather to sell their products. I saw a goose farmer, a goat cheese producer, a man who sold hazelnuts and walnuts and assorted products made from them, honey makers, and a baker. We bought some snails from a snail farmer from up near Blois and a bottle of calvados (apple brandy) from a distiller in Normandy (not local). Then we spent some time tasting wine -- it was a winery after all -- and brought home a few bottles. The event wasn't very big and it wasn't too crowded, and everyone was friendly and happy. All in all, a very nice time. One of our local growers replaced hundreds of old and diseased grape vines out back this fall. The vineyard workers identified the vines that had to go, pulled them up, then planted new vines in their place. 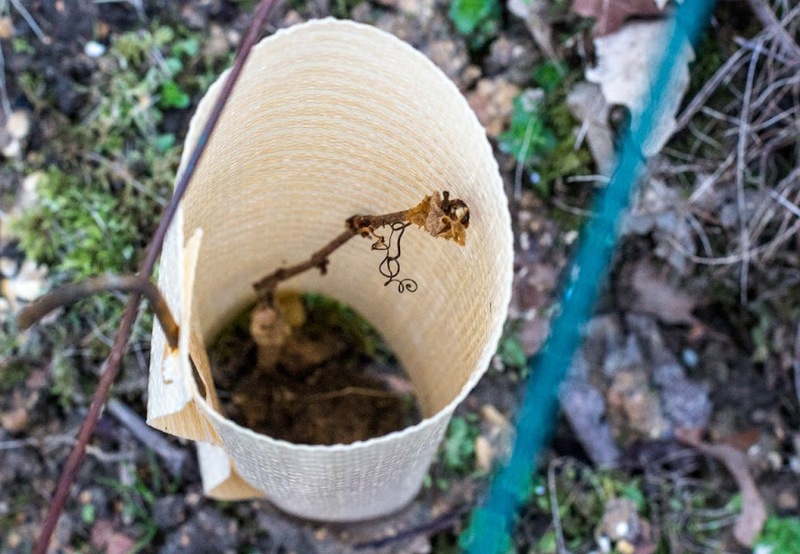 The new vines are protected from harsh weather and animals by cylindrical sleeves. The replanting took a few weeks, but it seems to be done now. The workers have already started the annual pruning process, which will continue through the winter. The red waxy coating, if there was one, is already gone from this newly planted grape vine. It's encouraging to see growers investing in the vineyards and their wine production. I've seen news reports about how French people are consuming less and less wine these days, and wines from other parts of the world are gaining market share. 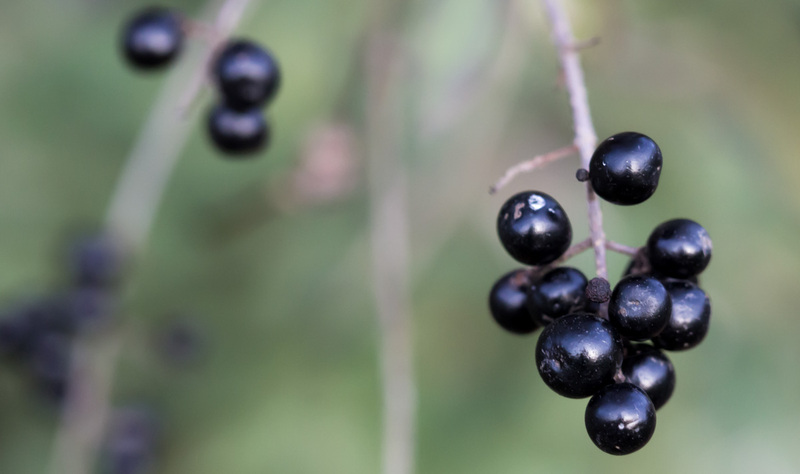 The demand for more localized, every-day varietals is lessening. 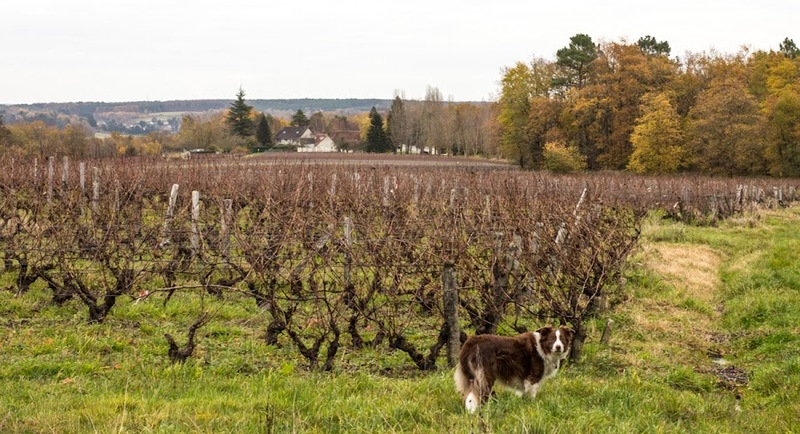 Most of the vineyards and wineries around us are small, family-run operations. Many growers belong to cooperatives that pool resources for wine production, bottling, and marketing. 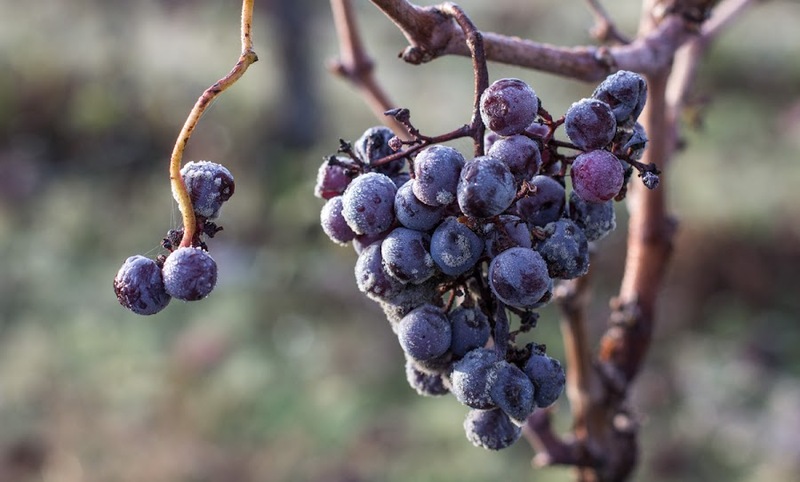 Other growers retire and don't have anyone to take over their business, so they sell, or try to sell, or sometimes simply abandon their vineyard parcels. Still, there are quite a few young growers and vintners out there, and many of them are moving into organic wine production. And established growers, like the one who owns most of the vineyards behind our house, are investing in their operations and marketing. We've seen some of our local labels in cafés and restaurants in Paris. One year while traveling, we even saw an organic wine made just down the road from us for sale in a store in central Illinois. Go figure! Not only is Angelina Jolie doing something-or-other that's coming out in theaters this week, but one of her movies is also on television. Most of the news programs are still processing the terrorist attacks in Paris and there's a lot of news coming out of the climate conference that continues through the coming week. 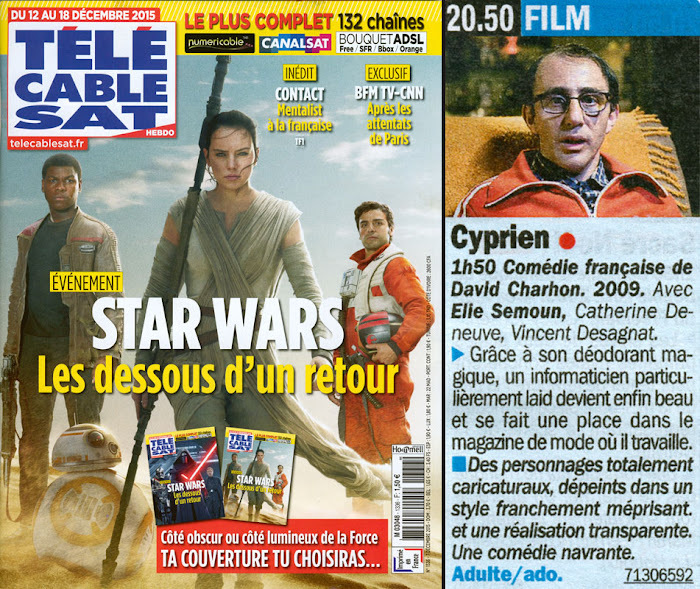 And there's an interview with Jean Dujardin. Angelina Jolie: One woman's battles. I'm not sure I've ever seen "American Pie," let alone its collection of direct-to-DVD spinoffs including this one. Its original title is "Band Camp." This is one of those instances where the French change the English title to another English title. I suppose "Band Camp" has no meaning to French people, but "No Limit" is a somewhat more familiar phrase. By the way, the word navet (turnip) is often used to describe a very bad movie. American Pie présente : No Limit ! (American Pie presents: No Limit!). American made-for-tv movie directed by Steve Rash, 2005. With Tad Hilgenbrink and Arielle Kebbel. ► A student is required to spend his summer at band camp. He tries to make compromising films with the band members. It would be difficult to make a more bogged down, less funny movie than this turnip. The calendar is moving closer to winter, but our weather seems to be stuck in fall. I think this is normal. The solstice and end-of-year holidays are fast approaching. 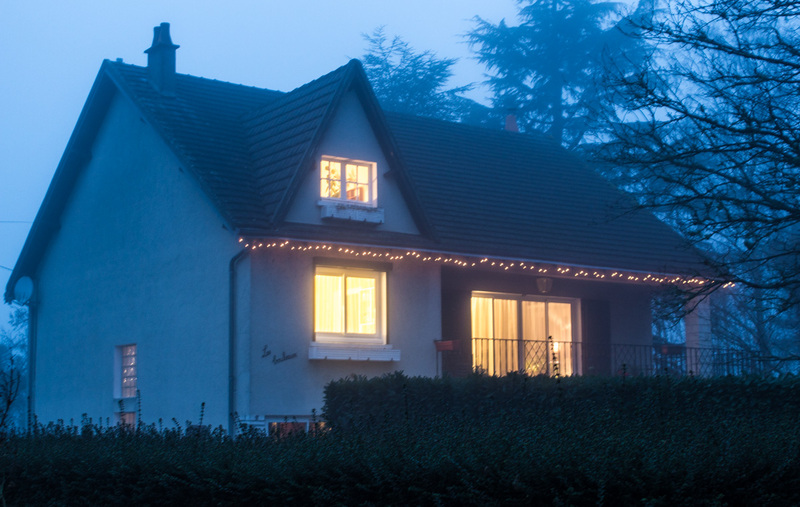 Decorative lights are up in most of the towns around. Scenes of festive feasts and kids with new toys flash by on television and in the flyers we get in the mail. So we expect it to be winter before it arrives. Then, once it finally gets here, we can't wait for it to go away. The reality is that our temperate-climate winters here are not of the Currier & Ives variety so familiar to Americans. We haven't seen snow in a number of years. For snow and winter activities, one has to go up into the mountains. 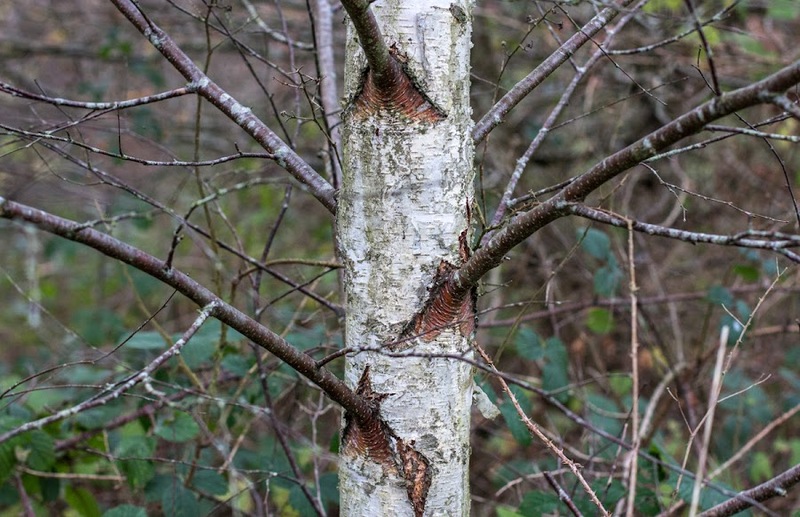 A birch tree, 50mm, f/4.0, 1/125s, ISO 1000. The wireless thermostat continues to work normally in its new location, which is on the dining room table. Not a single failure since Tuesday. I still have not cut down the artichoke stalks in the garden. On one level, I'm lazy and just haven't gotten around to it (or a round tuit). But (and this is my excuse), on another level, I think they look nice. Right now they're splitting open to release their seeds, which float away on silk when the wind blows. 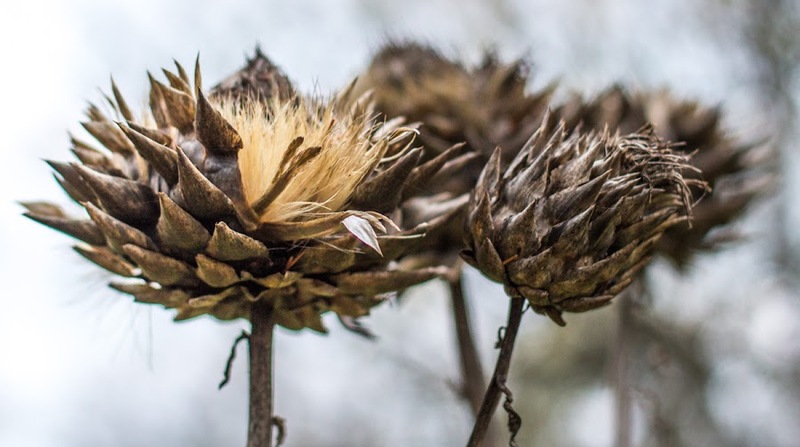 Dried artichoke flowers releasing their silky seeds. As for the wireless thermostat that came with the new boiler, as happens often, writing about it has made me into a liar. We waited and waited on Wednesday for the inevitable "fail" only to be disappointed. Or, not disappointed. There was no failure at the predicted time nor at any other time. My neat little theory fell apart. I have only one explanation: I had moved the remote unit to a new location. We suspect that the signal may have been weaker where we had originally put the unit. Now it's in a more open location. If that's the case, it's a very sensitive little box. We still think that the receiver, which is attached to the boiler itself, is in the wrong place. It's attached to the back side of the boiler, requiring that any signal pass through the boiler itself to be received. The documentation says that metal objects can block the signal. Already, the floor through which the signal passes contains steel beams. Strike one. There is also a reinforced concrete bearing wall in the way. Strike two. Then the signal has to pass through the boiler itself, a metal box filled with metal parts. Strike three. We may ask the installer to relocate the receiver unit to higher up on the wall behind the boiler to eliminate that obstacle. Stay tuned. Here's Callie on our way home from Tuesday morning's walk. She was happy because we cut through some woods on the way out. She likes the woods where she can follow the deer paths and smell all the good smells along the way. I'm looking toward our little hamlet with the river valley behind. Callie's looking back at me. I'm having one little problem with our new programmable wireless thermostat. I've noticed that every day, at around the same time, the unit drops its connection to the boiler's receiver. Once or twice it's reset itself, but most times I do a manual re-set which involves going down to the boiler, removing the unit cover, and pushing a button. I do this twice, because the unit will usually drop the connection a second time within a few minutes. But, after the second reconnection, it holds for the next twenty-four hour cycle. Then, the next day, the same failure occurs at around the same time. Is a puzzlement. I realized that this was a "pattern" yesterday, so I'm waiting today for around 10:00 to see if it happens again. I'm not sure what to do about it. I may try to reset the unit to factory defaults and see if that solves it. Otherwise, we'll have to call the installer back. There are still a few bunches of grapes here and there among the vines, missed by the harvesters. One good freeze and they will be gone, but that seems unlikely any time soon. Our temperatures remain unseasonably warm. I didn't even build a fire yesterday. A small grape bunch covered with morning dew. One good frost and they'll whither away. Pruning has started in the vineyards around us. Little by little, the naked vine canes will be cut away, leaving only one to sprout anew next spring. It's a job that must be done by hand, with a skill to recognize which cane should be saved, and where to cut the others. When the pruning is complete, the same hands will pass through the vines again, bending the surviving canes onto their guide wires and attaching them, preparing them for another year's growth.